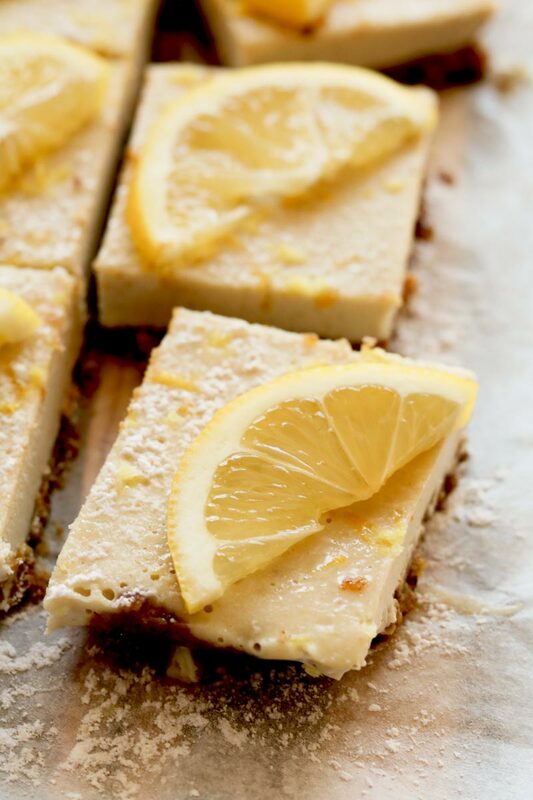 Inside Scoop: You’re going to love these refreshing, and simply delicious, dairy-free, raw lemon cheesecake squares. 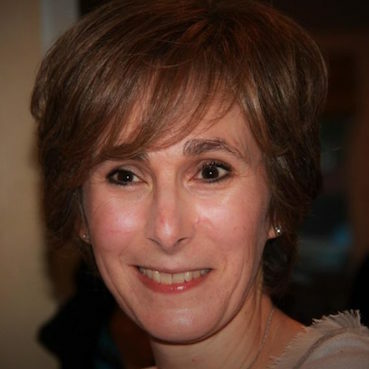 Just in case you are just tuning into our style of ‘health’, well, we believe that restriction can contribute to perpetual diet cycling and a feeling that you’re never really satisfied. 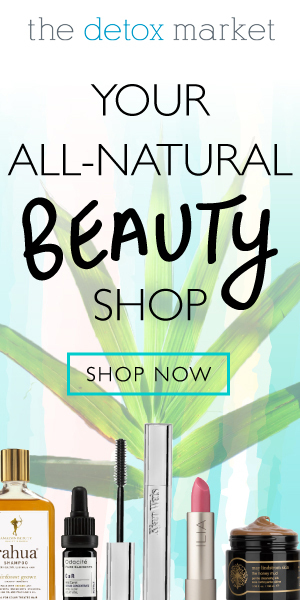 So you need to satisfy! Things like cake, cookies, cheesecake and chocolate can absolutely have a place in a healthy diet. 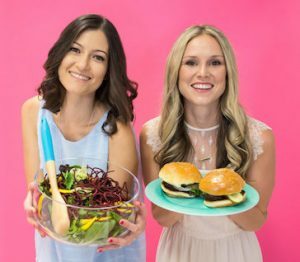 Just check out how you can Curb Your Overeating By Honouring Your Hunger to learn more about intuitive eating, a method we truly adore. 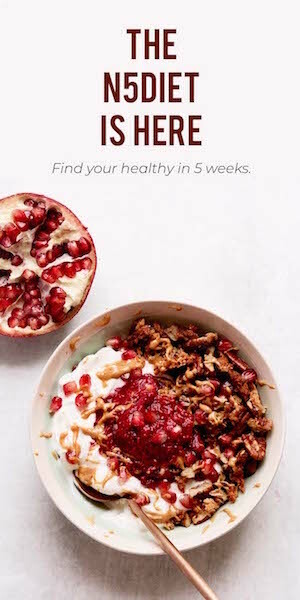 But by the same token, it doesn’t mean that these delicious goodies can’t be re-created in a much healthier style. For example, you can easily swap white flour for almond flour, and white sugar for cane sugar or maple syrup. These are just some simple health swaps that help re-create classics in a little more nutrient dense way. Voila! 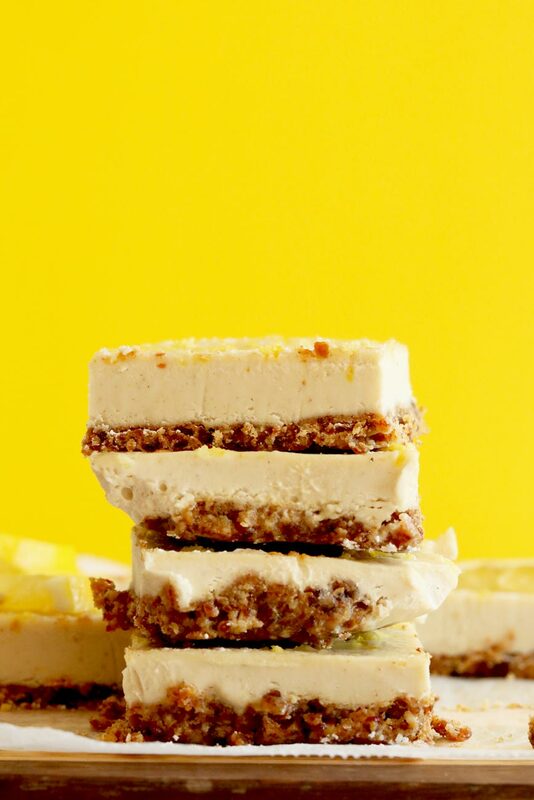 You’re healthy, and definitely refreshing, Raw Lemon Cheesecake Squares are here, and they will make a raw cheesecake lover out of even the biggest cheesecake fans! 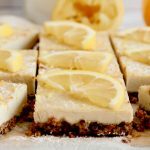 This raw lemon cheesecake is made with whole food based ingredients like nuts, dates, cashews, fresh lemon and maple syrup. A simple delicious treat that you are going to LOVE during the summer months (it’s really an all season treat, but especially nice in the summer). 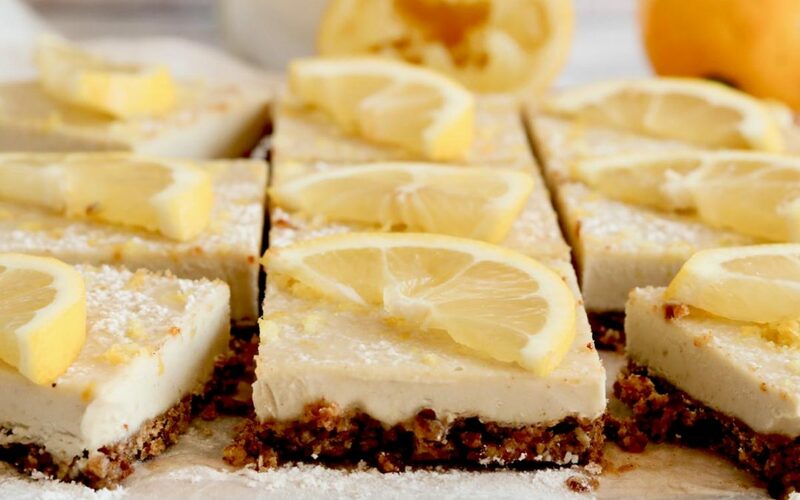 This raw lemon cheesecake recipe not only contains ingredients that are better for you than the classic cheesecake (that contains loads of sugar and dairy), but it’s really easy to put together. 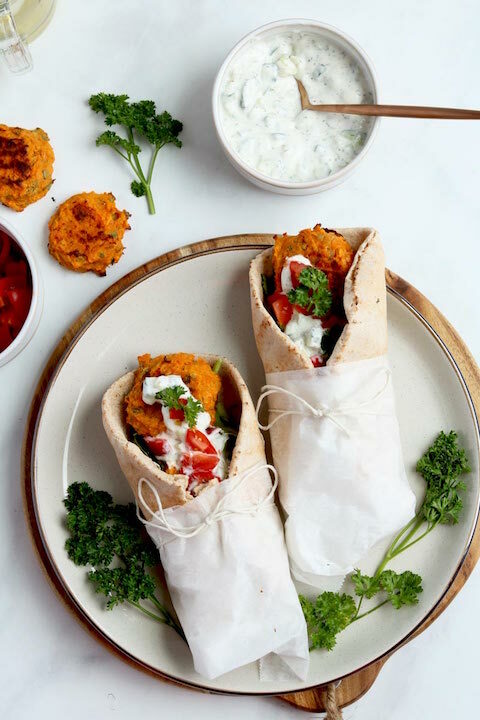 All you need is a food processor or a high-speed blender and you can prep this dish in about 10 minutes. 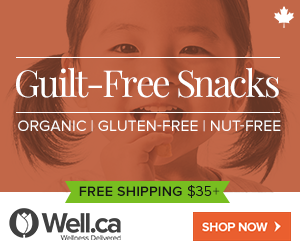 And it creates a fair amount of squares, so you can always have a sweet snack on hand! Our favourite way to enjoy this raw lemon cheesecake is with some delicious dairy-free whipped cream. 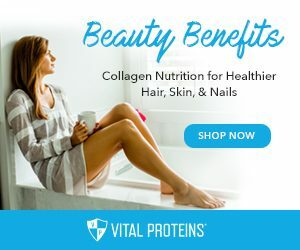 You might be looking for some more delicious healthy sweet treat ideas, you’re definitely going to want to check out these Chocolate Hazelnut Bliss Balls, and these Salted Chocolate Nut Butter Cups. Have you tested a vegan cheesecake yet? Let us know your thoughts in the comments below. 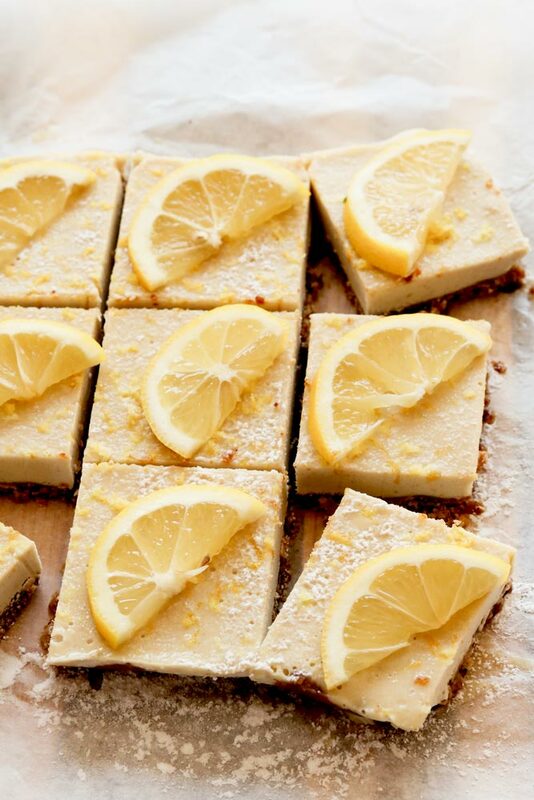 And, if you happen to whip up this delicious Raw Lemon Cheesecake, don’t forget to use the hashtag #naughtynutrition. 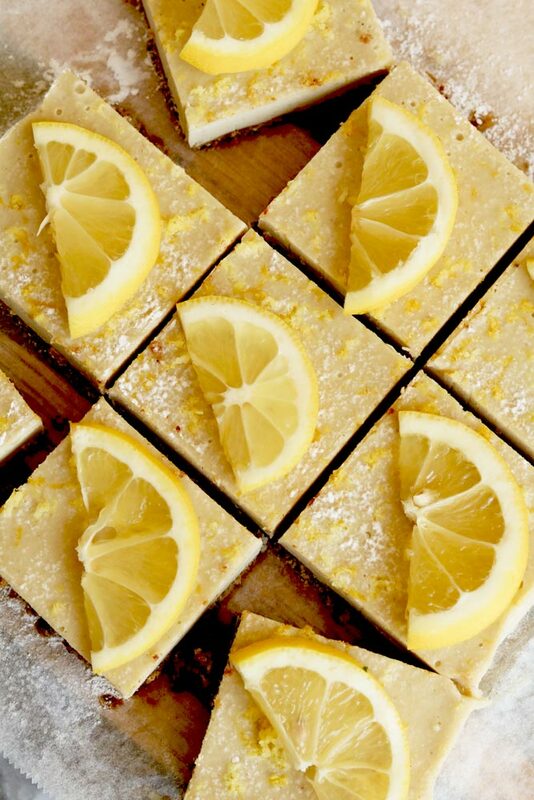 You're going to love these refreshing, and simply delicious, dairy-free, raw lemon cheesecake squares. Process all of the crust ingredients in a food processor and press into a square baking dish. Combine all the filling ingredients in a food processor and pour over crust. Place in the freezer until firm. It is best to eat these frozen as with they will get soggy if they come to room temperature.